This is Linus, a black jaguar living at the Munich zoo. 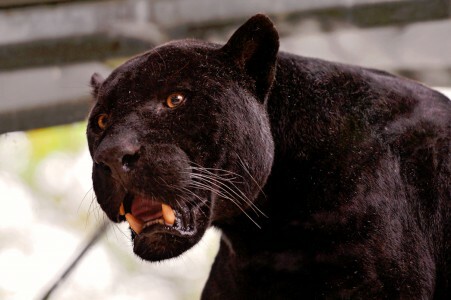 The black jaguar is the Latin American cousin of the African Black Panther. The jaguar is the only member of its genus, Pantera, to be found in the Western Hemisphere, ranging from Mexico to northern Argentina. The weight of an adult male jaguar will generally fall in the range between 120 and 210 pounds. Its length can approach six feet, not counting its tail. The jaguar is exclusively carnivorous. Its powerful jaws allow it to pierce the skull of its prey, which you might guess from the pose that Linus has struck for this jigsaw puzzle. Credit: Special thanks to Tambako for making the photograph used for this jigsaw puzzle available through the Creative Commons Attribution NoDerivs license. Visit Tambako's Flickr photostream. See all jigsaw puzzles based on Tambako's photographs.